The first spacecraft NASA has designed to fly astronauts beyond Earth orbit since the Apollo era is well on its way to making a flight test next year. The mission is planned for launch in September 2014, and will see an Orion capsule orbit Earth without a crew and return through the atmosphere at speeds unseen since astronauts last returned from the moon in 1972. To read more about this exciting development, visit https://www.nasa.gov/exploration/systems/mpcv/Triprogrambriefing.html. As Orion continues preparation to take astronauts further into space, take a look back at the recently ended shuttle program and have your students track the linear regression of a space shuttle launch. Check out the launch video of Shuttle mission STS-121 then have them create a scatter plot from real launch data. Linear Regression: Exploring Space Through Math—Space Shuttle Ascent is a NASA Explorer Schools featured lesson and is available in the NES Virtual Campus Lesson Library. NASA engineers have demonstrated the agency’s Orion spacecraft can land safely if one of its three main parachutes fails to inflate during deployment. The test was conducted Feb. 12 in Yuma, Ariz., when the test capsule was dropped from an airplane 7.62 kilometers, or 25,000 feet, above the Arizona desert. Engineers rigged the parachutes so only two would inflate, leaving the third to flag behind. To watch a video of the parachute testing, visit https://www.nasa.gov/exploration/systems/mpcv/chutetest_041812.html. As NASA prepares Orion to take astronauts farther into space, take a look back at the recently ended shuttle program, and have your students track the linear regression of a space shuttle launch! Check out the launch video of shuttle mission STS-121, and then have them create a scatter plot from real launch data. “Linear Regression: Exploring Space Through Math — Space Shuttle Ascent” is a featured lesson on the NASA Explorer Schools Virtual Campus. For more information about the parachute test, visit https://www.nasa.gov/exploration/systems/mpcv/chutetest_041812.html. The Vehicle Assembly Building, or VAB, at NASA’s Kennedy Space Center in Florida is undergoing renovations to accommodate future launch vehicles. Space shuttle-era work platforms have been removed and accommodations are being made to support a variety of future spacecraft, including NASA’s Space Launch System heavy-lift rocket. The changes are part of a centerwide modernization and refurbishment initiative in preparation for the next generation of human spaceflight. One of the largest buildings in the world, the VAB was constructed in the mid-1960s to support stacking of the Apollo Saturn V rockets that took American astronauts to the moon. 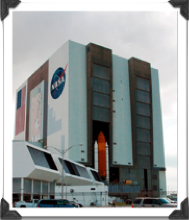 In the late 1970s, the facility was refurbished to accommodate the space shuttle. To read more about this renovation, visit https://www.nasa.gov/exploration/systems/ground/vab_platforms_removed.html. This article serves as a good extension to the NASA Explorer Schools featured lesson, Linear Regression: Exploring Space Through Math—Space Shuttle Ascent. To access this lesson, first log into the NES Virtual Campus home page. Through innovative partnerships with commercial rocket and spacecraft developers, NASA is making great strides to advance America’s next human space transportation systems. In 2010, President Barack Obama set the agency on a course to provide new transportation into space for its astronauts, while expanding human presence beyond low Earth orbit and enabling new missions of exploration across the solar system. NASA’s Commercial Crew Program was formed to facilitate the development of a U.S. commercial crew space transportation capability with the goal of achieving safe, reliable and cost-effective access to and from the International Space Station and low Earth orbit. To read more about the progress of NASA’s Commercial Crew Program, visit the Commercial Crew Program Feature page.This article is tied to the NASA Explorer Schools featured lesson, Linear Regression: Exploring Space Through Math — Space Shuttle Ascent. To gain access to this lesson, visit the NES Virtual Campus at http://explorerschools.nasa.gov. 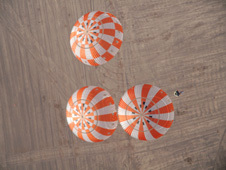 NASA recently successfully conducted a drop test of the Orion crew vehicle’s entry, descent and landing parachutes high above the Arizona desert in preparation for the vehicle’s orbital flight test, Exploration Flight Test -1, in 2014. Orion will carry astronauts deeper into space than ever before, provide emergency abort capability, sustain the crew during space travel and ensure a safe re-entry and landing. As Orion continues preparation to take astronauts further into space, take a look back at the recently ended shuttle program and have your students track the linear regression of a space shuttle launch! Check out the launch video of Shuttle mission STS-121 then have them create a scatter plot from real launch data. Linear Regression: Exploring Space Through Math—Space Shuttle Ascent is a NASA Explorer Schools featured lesson and is available in the Lesson Library on the NES Virtual Campus home page. Professional Development – Chemistry of Water: Mars Exploration — Is There Water on Mars? Learn to use an inquiry-based lesson about how atmospheric pressure and vapor pressure affect the boiling point of water. See why water’s boiling point is pressure-dependent, rather than temperature-dependent. Then, by extension, you will deduce if there could be liquid water on Mars. Opportunity for students in grades 4-12 to ask astronaut Greg Johnson questions during a live video chat about his education, astronaut training and experiences while living and working in space. Learn about the science of heat transfer and heat dissipation related to NASA vehicles, and receive an introduction to the associated engineering design challenge, Thermal Protection System. Nancy Hall, a research scientist at NASA Glenn Research Center, discusses different ways matter acts in the gravity on Earth and in microgravity and how she uses a drop tower for testing. Discover how you can use the Space Shuttle Ascent activity to construct a knowledge bridge for your students between the algebra concepts they learn in your classroom and space exploration. C.J. Kanelakos, a mechanical design engineer on the Robonaut 2 project will answer student questions about Robonaut 2, or R2. Join the video chat for an opportunity to ask CJ about her career path, how she became interested in technology and any questions you may have about engineering at NASA!Link to the NES Virtual Campus home page. 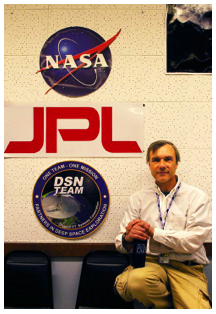 NASA Explorer Schools teacher Vin Urbanowski wanted to plan something exciting for a substitute teacher to use. He decided to use the NASA Explorer Schools featured lesson, Linear Regression: Exploring Space Through Math — Space Shuttle Ascent. Urbanowski planned this as an independent project and instructed students to create computer presentations for him to review when he returned to class the following day. This seemed to be a good way to ensure that students did the work. Upon viewing the student presentations, Urbanowski came up with several conclusions about the activity. He found that his students worked hard independently because they were genuinely interested in the topic. He also noted that breaking the lesson into two days — one for the work and one for presentations –- promoted responsibility and created an opportunity for students to defend their work. After completing the presentations, the students were thrilled to find out that they had actually learned some calculus. The activity, done in Urbanowski’s absence, challenged his students not only to complete a real-world NASA activity, but to present and defend their work. This story highlights a NASA Explorer Schools Strategy for Success for Curriculum Integration of NES materials. To access this lesson for your class, visit the NES Virtual Campus. Electrolysis of Water: Math and Science @ Work — A Breath of Fresh Air Web Seminar: As part of a series of electronic professional development experiences for educators, NASA Explorer Schools and the National Science Teachers Association are hosting a 90-minute live professional development Web seminar for educators on Feb. 21, 2011, at 8:15 p.m. EST. Learn how to implement a chemistry lab activity called “A Breath of Fresh Air.” During the activity, students create their own electrolysis apparatus to generate oxygen and use a Texas Instruments TI-Nspire calculator to collect data. Note: You do not need to have a TI-Nspire calculator during this professional development. For more information and to register online, visit http://learningcenter.nsta.org/products/symposia_seminars/NES2/webseminar13.aspx. Linear Regression: Exploring Space Through Math — Space Shuttle Ascent Web Seminar: As part of a series of electronic professional development experiences for educators, the NASA Explorer Schools and Learning Environments and Research Network, or LEARN, Projects are hosting a 60-minute live professional development Web seminar for educators on Feb 22, 2012, at 8 p.m. EST. Discover how you can use the Space Shuttle Ascent activity to construct a knowledge bridge for your students between the algebra concepts they learn in your classroom and space exploration. For more information and to register online, visit https://digitalmedia.wufoo.com/forms/nes-webinar-registration-linear-regression/. Engineering Design Challenge: Spacecraft Structures Web Seminar: As part of a series of electronic professional development experiences for educators, the NASA Explorer Schools project and the National Science Teachers Association are hosting a 90-minute live professional development Web seminar for educators on Feb. 23, 2012, at 6:30 p.m. EST. Learn how to incorporate the excitement of rocketry into your classroom during this Web seminar and receive an overview of the student engineering design challenge, Spacecraft Structures, where students design and construct a strong, but lightweight, structure that can withstand the launch of a water bottle “rocket.” For more information and to register online, visit http://learningcenter.nsta.org/products/symposia_seminars/NES2/webseminar14.aspx. Orion, NASA’s next deep space exploration vehicle, is designed to carry astronauts into space, provide emergency abort capability, sustain the crew during space travel and ensure safe re-entry and landing. 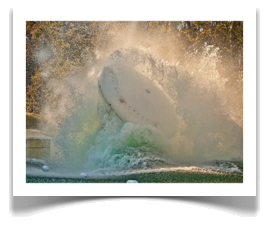 On Jan. 6, after six months of testing, an 8,165-kilogram (18,000-pound) Orion mock-up took its final splash into the Hydro Impact Basin of NASA’s Langley Research Center in Virginia. For more information about the Hydro Impact Basin testing, log in to the NES Virtual Campus and watch the NASA Now program, Forces and Motion: Landing and Impact Research Facility. Tests simulated different water landing scenarios. The tests took into account different vehicle velocities, parachute deployment systems, entry angles, sea states and wind conditions Orion could face when landing in the Pacific Ocean. As NASA prepares Orion to take astronauts farther into space, have your students take a look back at the recently ended shuttle program by having them do the NES featured lesson, Linear Regression: Exploring Space Through Math — Space Shuttle Ascent. In this lesson, students track the linear regression of a space shuttle launch and create a scatter plot from real launch data.